In January 2014, Iain Duncan Smith, Government Secretary of State for Work and Pensions, set out plans for the future of welfare in the UK. But difficulties with illness, finding suitable work and trying to manage family finances mean it is far from simple for many hard-pressed families. Almost 1 in 20 households using the Sanctuary Scheme for people at risk of domestic violence have been affected by the removal of the spare room subsidy, reports Lorcan James. Once again we’ve rounded up some of the key updates from @HMIwelfare over the last week into a Flipboard magazine. Stories include unfit royal housing benefit property, claims that food poverty is a bigger public health concern than diet, how the sale of small council homes condemned thousands to the bedroom tax, and an equality analysis of the planned closure of the Independent Living Fund. Click here to read the magazine. Follow them all – and over 40 others – as a list here. Helen Barnard is Research Programme Manager at the Joseph Rowntree Foundation (JRF), the social research policy charity of Quaker origins. The JRF conducts a range of research into welfare issues, and created the MIS, the Minimum Income Standard, estimating what is an adequate income based on what the public believe to be minimum living standards. 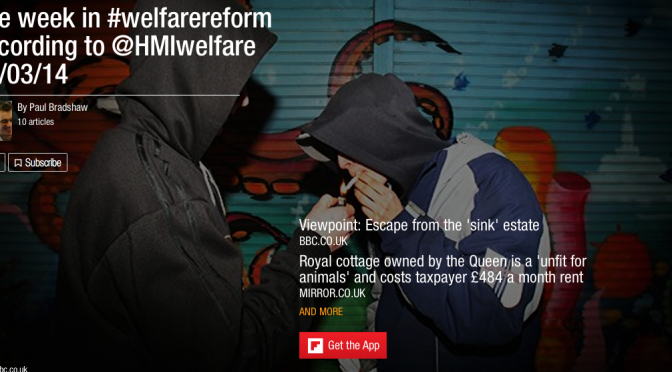 How to compile a news feed on welfare issues (or any other) – part 1: what’s going on? 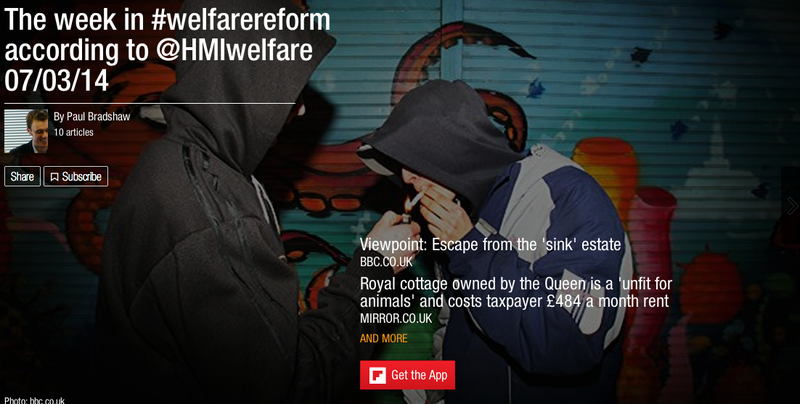 Earlier this week we published our list of 19 places to follow welfare developments. In the first of a three-part series, we explain how to get your own list of useful feeds into one page, and share it with others. Follow the instructions above on creating an account with Netvibes and adding feeds. Sharing a room with her four year old disabled son, Brenda*, a single mother from Ladywood, is just one of the 37,000 households in Birmingham living in congested conditions, making the West Midlands responsible for almost half of families living in overcrowded accommodation across the country.